Mayor Jimmy Davis announced that the Joe Bayer Band will present a free concert at the Bayonne Community Museum on Monday, May 2. The doors will open at 6:30 p.m. The concert will start at 7:00 p.m. The George Orlando Band concert will be the latest show in a series called “Musical Mondays at the Museum,” which has taken place on various Mondays during the winter and spring of 2016. Mayor Davis said, “The Bayonne Community Museum is a great place for a concert. We would like to encourage more of our residents to come and enjoy the arts at this beautiful location for special events.”his free concert is sponsored by the Bayonne Urban Enterprise Zone (UEZ) and BCB Community Bank. Light refreshments will be served. The Joe Bayer Band plays country rock. The seven-member band has a musical sound that employs vocals, guitars, keyboards, drums, banjos, fiddles, mandolins, and a bass. The group’s leader, Joe Bayer, has played gigs in the Midwest, California, and the Northeast. Joe Bayer has also played at awards shows in Nashville and Nevada. The band has been the opening act for the Charlie Daniels Band, Kip Moore, The Farm, The Lost Trailers, and other groups. The band has produced a single, “Country Thang,” which has been played on Sirius XM and other radio stations. The Bayonne Community Museum is located at 229 Broadway, at the northwest corner of 9th Street and Broadway. The museum stands one block north of the 8th Street Light Rail Station. 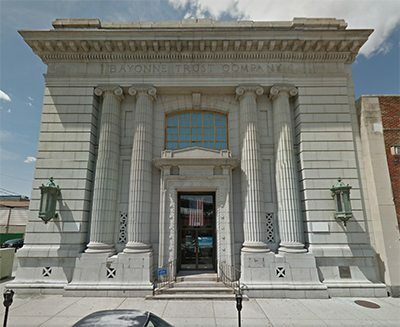 Constructed in the Beaux Arts architectural style in 1912, the building began its life as the Bayonne Trust Company, and was the home to a series of banks for ninety years. The City of Bayonne acquired the building from Fleet Bank for one dollar in 2002. Utilizing a series of grants, the municipality removed modern banking fixtures and a dropped ceiling from the interior of the building, and restored the interior walls and the three-part stained glass in the ceiling. The former bank is on the State and National Registers of Historic Places. The museum is available for exhibits, performances, cultural events, and meetings. For booking information, please contact Pete Amadeo in the Bayonne Recreation Division at 201-858-6129.